Here is a solution of two rings and a closed loop with 15 arcs, all matching their paths. 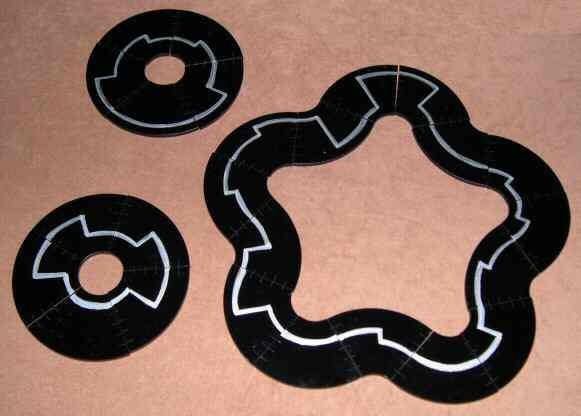 See how the rings have symmetrical path patterns and contain one "double" tile each. Double tiles have an arc that connects the same level  1-1, 2-2, 3-3, 4-4 and 5-5. All the other tiles step up or down between different levels. See also how on the larger loop the arcs turn in and out, so that converse edges meet  1 to 5, 2 to 4  while 3 meets 3 either way. That's a valuable hint for solving, saving the 3's to the last. A framed, 18x24" poster-size print of the full, single-loop solution with its largest enclosed area was exhibited at the Joint Mathematics Meetings art show in Baltimore in January 2019. It's so beautiful, we're thinking of offering it as a stand-alone work of art. 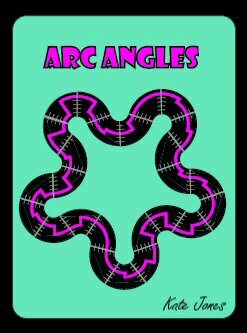 Let us know if you're interested in acquiring a framed copy: Arc Angles print.